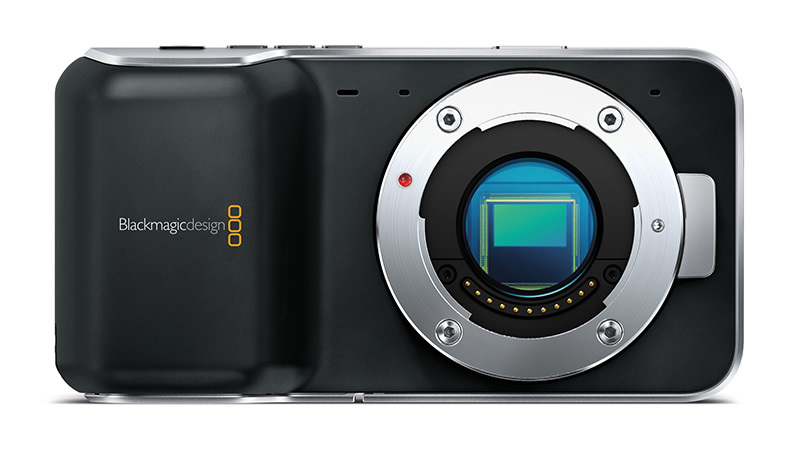 The Blackmagic Pocket Cinema Camera is a marvelous, little, point-and-shoot-sized video camera with a Super 16mm size 1080 HD sensor, with 13 stops of dynamic range, built in SD card recorder for Apple ProRes 422 HQ, 12-bit CinemaDNG RAW, and active Micro Four Thirds lens mount that accepts a multitude of MFT still lenses and mount adapters (including PL). Standard connections including mini jack mic/line audio in, micro HDMI output for monitoring with camera status graphic overlay, headphone mini jack, LANC remote control and standard DC 12 power connection. Blackmagic Design also announced the immediate availability of Camera 1.8.2 software which adds three new Apple ProRes file formats for the Blackmagic Cinema Camera, Blackmagic Pocket Cinema Camera and Blackmagic Production Camera 4K. Camera 1.8.2 update is available now free of charge from the Blackmagic Design website (support-Professional Cameras). Blackmagic Design cameras recorded in both CinemaDNG RAW or compressed ProRes 422 HQ formats. This new software update adds three additional Apple ProRes file formats: ProRes 422, ProRes 422 LT and ProRes 422 Proxy. This means significantly smaller video file sizes allowing much longer recording times on the same media card in 10-bit 4:2:2. With ProRes 422 Proxy it is possible to record 230 minutes of 1080 HD video on a single 64GB SD drive. Selecting the type of ProRes format for recording can be set via the on screen menus and all ProRes types can be played back instantly. All ProRes files recorded with Blackmagic Cinema Cameras and Blackmagic Production Camera 4K can be opened directly in DaVinci Resolve 11 and Apple Final Cut Pro X for immediate color correction, editing and finishing.